Even though the dust has just settled from Apple's big iPhone 6 and 6 Plus event last month, the Cupertino company isn't letting up, oh no. At a much smaller event in San Francisco, Apple has just unveiled its 2014 line of tablets - The iPad Air 2 and iPad Mini 3. Not the most inventive names, we'll give you that, but does this new pair of slates represent a big jump last year's already impressive releases? Let's first see how the new iPad Air 2 compares to 2013's original iPad Air, one of our favourite tablets from last year. We've had Apple's impressive Touch ID fingerprint scanner on two generations of the iPhone now and we were disappointed when it didn't make its way to the iPad range last year. But, 12 months later and now we can finally unlock our tablets with a tap of the thumb. Yes, Apple has replaced that old home button that sat on all previous iPad's with a new sapphire crystal coated version that boasts Touch ID. Not only does this make unlocking your tablet easier, and more secure, but thanks to improved developer tools in iOS 8, many apps now use Touch ID. For instance 1Password, an awesome password aggregator, lets you tap your thumb to open the app and access all your saved passwords. 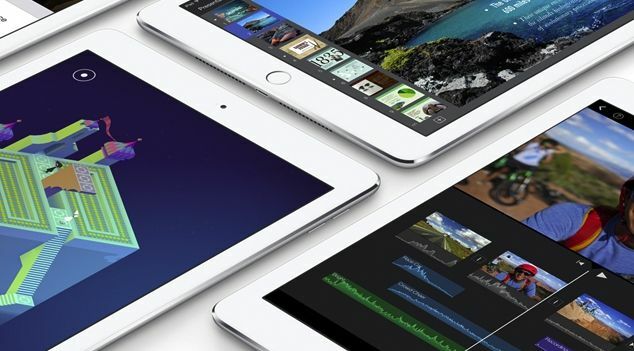 Apple's iPad 2 also comes running iOS 8.1, the first major update to the operating system released last month. 8.1 brings in a few improvements, iCloud Photo Beta, for instance, is now open to everyone. The camera roll is back too - huzzah! Apart from that it's pretty much just big-fixes and support for Apple Pay across the pond in the US. Speaking of Apple Pay, it will be coming to the iPad Air 2, but only for online sales. So you won't be tapping you tablet on a credit card machine anytime soon. On any tablet the screen is really important, possibly the most important part. It is, after all, basically just a big display you manipulate with your fingers. As with all full size versions of the iPad since its 2010 release, the iPad Air 2 comes packing a 9.7-inch display, with a 4:3 aspect ratio. The resolution on the iPad Air 2 is still the same as the iPad Air, that's a very impressive 2048 x 1536 and it sticks with the Retina moniker, unlike the iPhone 6 and 6 Plus which have been bumped to Retina HD. The iPad Air had a fantastic display, with accurate colour representation, impressive viewing angles and it even performed admirably outside, so we have high highs for the panel sitting upon the iPad Air 2. After going through a radical redesign with the iPad Air, we didn't really expect much change to the way the iPad Air 2 looks and feels, and we were right. But, that doesn't mean nothing has changed at all, becuase it has. The iPad Air is now even thinner, measuring just 6.1mm thick, 18% thinner than the first iPad Air. It's also the world's thinnest tablet, a phrase we're sure Apple will use over and over again. Weight wise the iPad Air 2 comes in at 437g for the Wi-Fi model and 444g for the Cellular, that slightly lighter than the first iPad Air which tipped the scales at 469g and 478g respectively. There's a new anti-reflective coating on the screen too, which should give you a better experience if you're out and about. Another thing to note is that the 'mute' switch has gone, which must be to save space. The iPad line has often tended to feature a beefed up version of the processor that Apple has used in the preceding iPhone, and this year is no different. Powering the iPad Air 2 is the A8X chip, a souped up version of the A8 that runs the iPhone 6 and 6 Plus and an improvement over the A7 that was used in the first iPad Air. There's also the updated M8X motion chip too, taking over from the M7 in the original iPad, that'll take care of all your motion needs. Even though it wasn't alluded to at the event, most rumours point towards the iPad Air 2 packing 2GB RAM, an improvement over the 1GB that was used in the original iPad Air. In-fact, if the rumours are true, the iPad Air 2 will be the device from either the iPad or iPhone family to boast the improved amount of RAM. What difference will the upgrade make? Well, we'll have to take a closer look during our full review, but we hope it'll alleviate the annoying issue of tabs in Safari constantly needing to be reloaded. As always there'll be a 4G LTE model available, though expect to pay a premium for that on-the-go internet functionality. Bluetooth 4.0 is of course a given, as is fast Wi-Fi with the ac MiMo bands supported for the first time. Apple has also ditched the 32GB model, so your options are 16GB, 64GB and 128GB. Now, we're not the the biggest supporters of tablet photography, but it seems that many people are, so lets take a look to see if Apple has improved the front and rear cameras on the iPad Air 2. Let's start with the FaceTime HD snapper on the front, which retains the 1.2 megapixel resolution and the ability to shoot 720p video, but the whole sensor has been upgraded and it brings all the face detection goodness we first saw on the iPhone 6, along with the burst selfie mode. On the back you'll find the a new 8 megapixel shooter with autofocus, face detection and f/2.4 aperture, it now also boasts a new Burst mode for snapping multiple pics by holding down the shutter button, a Timelapse mode for speeding up clips and a slo-mo mode with taking things down a notch. Apple claims you'll be able to take fantastic snaps with the iPad Air 2, mainly down to the A8X processor. The iPad Air 2 will start from £399 for the 16GB, £479 for 64GB and £559 for 128GB.